So glad to have you joining me for this series. 31 Pinterest projects in 31 days. So here it is, the FIRST one! Many of you probably have this gorgeous picture from Country Living pinned on your Pinterest page as I did. And if you do a search on Pinterest for “Mason jar soap dispenser” you will come up with lots of different tutorials. Some of the different tutorials feature spray painted lids, the zinc lids from vintage Mason jars, and some even had the lids and pump spray painted. So I decided to try out 2 different options. You will need a Mason jar (or any type of jar), and a soap dispenser. You can just use any dispenser off of any soap dispenser you have laying around. I used 2 dispensers – a foaming one from Bath & Body Works and another pump off a regular dispenser. I picked up my Mason jar at Hobby Lobby – watch for their sale on glassware and you can get them for 50% off. So mine cost 89¢ and came with the lid too. And the pump was free so this was a very cheap project! You will need to make a hole in the lid. You can do this many ways – with a drill, with a nail and a hammer, or with wire snips. I just used a nail and punched holes and then bent the metal back under the lid. Make sure that your hole is big enough for the pump/straw part to go in but small enough so that the “screw” part of the soap dispenser will cover the hole. Now the next part depends on whether you just want to paint the lid, or if you want to paint the lid and pump together. I wanted to try both ways to see which one I liked better. For one of my dispensers just painted the lid. So I put the Mason jar into a plastic bag and then screwed down the lid over the bag. For the other dispenser, I wanted to paint the entire thing. So I went ahead and glued the pump to the lid. I just used regular hot glue and made sure to really coat the surrounding of the pump/edge of the hole underneath. You will want to create a seal of sorts so your soap doesn’t leak out and so that the raw metal metal edges don’t rust. Here is my first dispenser painted with Krylon Oil Rubbed Bronze spray paint. I primed with gray spray paint first, then did 2 light coats of the ORB paint. Here’s a tip for you. Do you know how to make your own foaming hand soap? It is super easy and can save a lot of money! Just add any kind of soap (I used a clear yummy smelling hand soap, Dial?) to bottom of your soap dispenser. You will only want 1/2 inch or 1 inch depending on the size of your container. Add enough water to fill up your container. Then just do a simple shake or stir it to mix and you have an entire jar of soap and you only used a tiny bit of soap. Here is one jar in my kitchen filled with Dawn soap. So much prettier than that Dawn bottle sitting on my sink! get a little closer and this is where this project starts to go wrong. See my dispenser… yep, the paint is coming off. Not pretty. 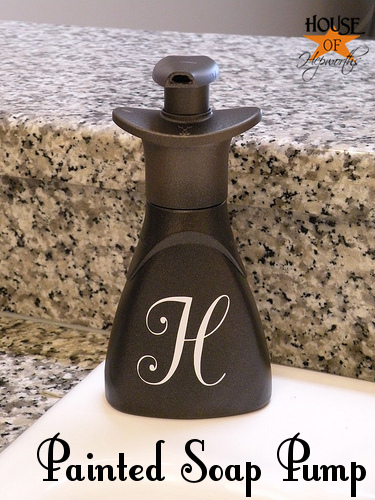 Now I have seen plastic soap dispensers just like this spray painted and they hold up just fine. Allison at House of Hepworths painted an entire Dawn foaming hand pump and has even updated her post and said that a year later it still looks exactly the same. So I know it can work. But she used spray paint specifically designed for PLASTIC! So I could maybe try that. BUT, I have also had a small spot on my lid that I accidently nicked with my fingernail chip too. The concept works perfect – it is just in trying to paint the lids/dispensers where things start to come apart. So if I could find a pretty metal dispenser and a lid that matched and I didn’t have to paint either one, this project would be perfect! I did find a site to buy pretty metal soap pumps for cheap – about $3.00 each. So that is another option. Or I could just decide that not having them match is ok too. Because honestly this dispenser I had pinned from Winthrop Chronicles is very cute! If I do decide to change it or re-spray paint mine, I will update this post and let you know! Until then, I am going to just enjoy not having the ugly Dawn bottle on my kitchen sink. 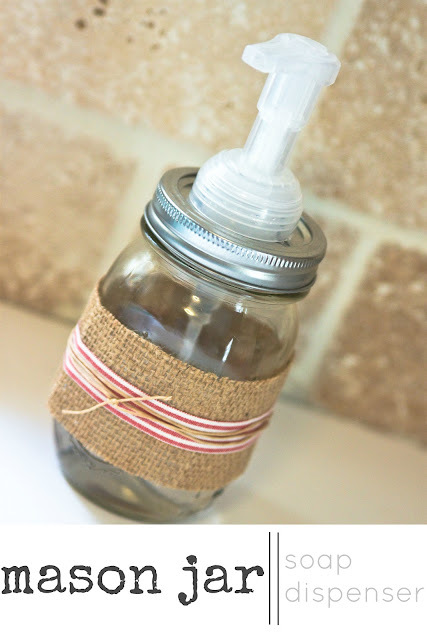 Have you ever made a Mason Jar soap dispenser? What worked for you? Do you have any suggestions for my chipping pump? so excited for this series to start – loved them both ways – but yes maybe krylon paint for plastic might be a better choice…I wouldn’t consider it a failure – not doing it would have been the fail…learning is good! You’re right, a nice dispenser looks so much better than the plastic ones the product comes in. I need to change mine out. How fun! That is such a cute project; I want to make some for our home. Hey Christina! I’ve waited all day for your post to show up in my email so I could see what your first project would be! I think Allison’s soap pump was one of the first things I ever pinned and have yet to try it. Your tutorial is very helpful. I think I’ll give it a try now! I love the one in the bathroom that looks like a blue Mason jar. Can’t wait to see what the next 30 days hold in store! What a fun project for you to take on. Love this one and anxiously await the next! I think you forgot the add water part. Or else I missed something. Thanks for doing the compare paint part. That’s why I haven’t tried it. Plus I did not want to use a Zinc lid. I kind of like it plan so I’m going to go make one now. I need it before I wash the dishes right? Congrats on Day 1 of 31! Sorry your paint chipped! 🙁 Love the look though even chipped! Renee@ Living Laughing & Loving recently posted..Menu Monday… my favorite meal! Christina, I am so glad you decided to join the 30 days with crafts. I love your blog and know whatever you decide to do I will love it. Wendy recently posted..It’s Monday, What Are You Reading? I love your series. I have always wanted to attempt those mason jar soap dispensers. Thanks for inspiring me! And yes, I do all my soaps mixed with water. It’s a must do in my home with four kids, ha! So nice to meet you, Christina! Spray paint for plastic? Brilliant. I have dozens of mason jars, and this is one of my project lists. I need to make it like you did. So cute! And I make my own foaming soap, too, which I love! I am so excited for your 31 day blog! You have inspired me to follow along and do 31 days of Pinterst projects too, the first one is already great, going to buy a Mason jar today, I need to catch up! SO,,,,,I took up your challenge, drug the kids to Hobby Lobby and I now how a mason jar soap dispenser!!! YAY! Thanks for the encouragement! I think your jar is perfect. What does it hurt if you spray a bit of paint or even use acrylic to dab when the paint wears off? No one would know. I wouldn’t even bother respraying the whole thing. Just dab a bit of paint when you notice it looking shabby! I’ve used the acrylic cheap paints to paint outdoor plastic things and just touch up as needed. I figure if it’s ruined I can always splurge on a new soft soap and get a new pump and more soap anyway!! This may make it into my adult kid’s stockings this year!! Thank you for the post and the tip on gluing it. I’d have never thought of that! I love this idea but I have problems with my hands and am afraid of dropping glass. I am going to recycle a pint size plastic mayo jar. Can’t wait to get started! Great Idea with the mayo jar! Very smart! Hi! So I loved your post and went to Hobby Lobby and bought the Mason Jars. I did eveeything but for some reason the hot glue isnt working for me.. any other ideas? Thank you! I would try using E-6000 glue, that stuff is strong! thanks, I need to try that! i tried this and missed the part about the glue. what i used was an old method foaming pump bottle i had. my husband made the holes with some tool he has in the garage but the whole top was loose with no glue. so what my husband did was cut the threaded part of the top of the bottle and put it on the bottom of the flat lid then thread the pump part to it. also we used 2 flat lids so it would be sturdier than just the one the jar came with. i didn’t paint mine bc i was afraid of chipping especially with the constant use. mine look like great especially bc the finishes in my bathroom are brushed nickel and the pump is clear plastic. the one i made for the kitchen i used a kitchenaid black plastic pump bottle i got at lowes. we did the same thing…no glue…and it looks great too! thanks! Thank you for sharing this! My husband made my hole a little big, too. The idea for the underneath is great! I was trying to figure out if i needed a washer or something. This is easy-peasy. Christina, I LOVE this post! THANK YOU for being SO detailed and for trying & posting the different paint methods. My fiancee recently painted our cheap-o 13-gal white kitchen trashcan with shiny black paint and it looks sooo much better! Plastic paint is great! And, the food coloring idea (& pic) is fantastic!! So excited to try this out!! This Mason Jar Pump is also a great idea for condiments at a picnic, mouthwash (especially homemade! ), or a handy way to dispense a bit of oil (especially when it’s used on the skin)! I’ve been making my own foaming soap for a while, too! I like dr bronner’s lavender as my base: smells good, super foamy, and good for skin & planet, too! Even better, in glass! For slippery applications, I use a pretty, wide rubber band or two (like the ones that come with with asparagus) around the jar to help with grip. Maybe one of those livestrong-type silicone bracelets would work? If you drink out of your mason jars, check out reCap, cuppow, or mason jar pour spout (looking for them is actually how I found your blog) – go figure! Thanks again – for the work, the post, and all the helpful replies! Greatly appreciated!! These are super cool Christina! I’m just getting around to checking out all the goodies from 31 days. Better later than never, right?! Where did you get free pumps? Or where can I buy them? I didn’t see any at Hobby Lobby. Also, that coloring works better than regular food coloring? I feel like my hands will turn that color! But I have never made anything like this before, so I wouldn’t know haha. I think my mom will like it so I am attempting it. I am excited! 🙂 I just don’t know where to find the pump. And I got a glue gun, but reading your comments, maybe that is not working out so well? So adorable – making a bunch of these for teacher gifts, etc! Quick question: what size jar works best? I think they are quart size jars. I would say those work the best. You may be able to use pint size jars but they may be a little small. mine i got at hobby lobby are pint sz the quart are huge!! Where did yo ubuy your pumps from , cheap? I’ve bee making my own foaming soap to refill my B&B Works dispenser. I use a squirt of dish soap and about a TBSP of body spray, then fill the rest with water. That way, it actually smells like B&B Works too! I have a bunch of used pasta sauce jars, they have pretty little designs embossed on the glass, I think this is exactly the project I have been saving them for! These would be perfect for a Mother’s Day or teacher gift also! Thank you for all of your trouble-shooting and for writing a great tutorial! Love this idea. We’re going to try it on our next “Sisters Craft Day” in March. Someone asked about glue suggestions. My favorite is one called E-6000, available in craft stores, hardware stores, and probably even Wal-Mart. It worked great on our last project, which was glueing metal posts to ceramic cups & saucers (birdfeeders — adorable!). Such a great idea! I’m in my kitchen at 10pm punching holes in my old mason jars! Love it! Such a cute idea! I’m in my kitchen at 10pm punching holes in my old mason jars! Love it! This is a wonderful idea-turning mason jars into soap pump dispensers. I do prefer the look of a metal pump top though. yes, I do too. I need to purchase some online and change my pumps out. It is cheaper to buy a box of jars with lids and seals. Only about 8 or 9 dollars. Then you can use the rest for crafty gifts. What kind of glue did you use to glue the pump to the jar lid? Did you try spraying your painted lids/pumps with a clear acrylic sealant? You can buy it in either a glossy or matte finish. Just make sure the pump still works and doesn’t stick! I did this a while back, before I saw posts about other people doing it. I was wondering, I did not paint my lid and it has since rusted and the glue separated from the lid; any thoughts why or how to remedy this? Thank you so much for your detailed instructions. I have been wanting one of these for a long time now. I have plenty of jars and a pump I have had for ages I got from Avon. I am going to make one tomorrow. Thank you so much. I havnt done this personally, though I want to. However, I would think you’d want spray paint for plastic and spray paint for metal, rustolium? and then, if you want, spray paint for glass for the jar, or frost it or something. to keep the lid on, what I would do is cut off the top of the original jar about an inch below the neck where the pump screws onto. then use this on the underside of the jar lid to keep it secure. I have been making bathroom hand soap from slivers of bar soap saved from the shower. I take about 1/8 cup of slivers to 16 ounces water and 1/8 cup cocoa butter, allow them to soften over night in the water, then blend it until smooth and frothy. we have been using a small blue and clear vodka bottle I found and simply screwed the dispenser top onto. Thank you so much for this wonderful tutorial! What cute gifts these will make for any occasion. A ribbon could be placed around the jar to reflect each holiday. At your local arts and crafts stores they have all kinds of holiday ribbons in different widths and a lot of them are printed now with little pictures and/or sayings. The following time I read a blog, I hope that it doesnt disappoint me as much as this one. I really thought youd have something fascinating to say. can fix should you werent too busy looking for attention. I also made a soap jar with the bath n body works foaming soap pump and its not coming un glued and rusty ? Tips? thanks and the honesty- super…. You could always try using a clear coat after you paint your dispenser and lid. That usually helps to keep the paint from chipping or wearing off. Love this item. My grandson made and gifted them for Christmas. My pump is not foaming however. It did initially, but now only liquid comes out. Any suggestions? It has to be an actual foam pump or it won’t work.